Nothing official to report on the Dark Knight Rises front today, but if you're the type who likes to indulge in some Batman movie rumors, then we do have a few things worth your spare minutes of time. First up there are some fan-made Dark Knight Rises posters we have to share. While you may have seen our own Screen Rant original Batman vs. Bane image floating around the Interwebs, the guys behind the posters featured in today's gallery clearly have more photoshopping skills than we do. In addition to the fan posters, we have multiple, conflicting, possible (and I stress the word "POSSIBLE") descriptions of the six-minute Dark Knight Rises prologue, which will be attached to the IMAX prints of Mission: Impossible - Ghost Protocol later this month. Below you'll find the gallery of Dark Knight Rises fan posters. Tom Hardy's Bane is clearly the favorite focus of these posters, which were put together by "Dogan Can Gundodu," as well as DeviantART users "agustin09" and "visuasys." 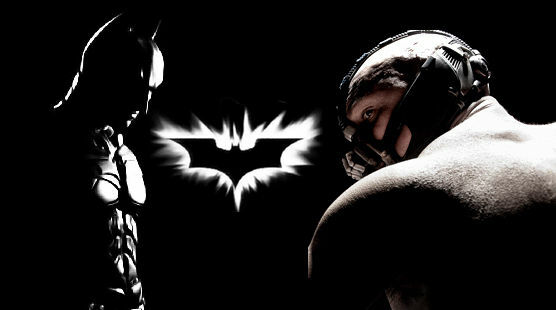 The gallery includes a Bane vs. Batman poster, individual Bane and Batman posters, as well as some Bane wallpapers. A lot of the posters also sport quotes like "take control of Gotham," or "Every Legend Has Its End," with one sporting a fitting line: "We Fall to Learn to Pick Ourselves Up" - the famous words Dr. Thomas Wayne spoke to young Bruce after the boy fell down the well in the beginning of Batman Begins.